Hips 0/0 Total zero - hips can’t get better than that - wow! Unfortunately Phoebe inherited her dislike of the show ring from her Mum, Darcie, so she has hung up show lead and retired to a life of hunting rabbits and advising passing cyclists to keep on peddling!!! 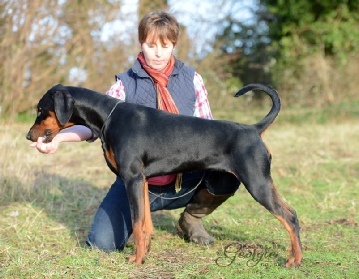 FCI World Champion IDC and DV Sieger. 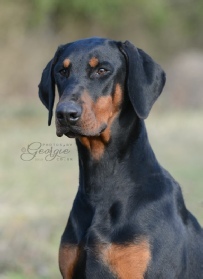 He is also SchH III, FH, ZTP V1A and Angekort 1A -that means that is a dog which passed also the most tough breeding - character test in the dobermann world.